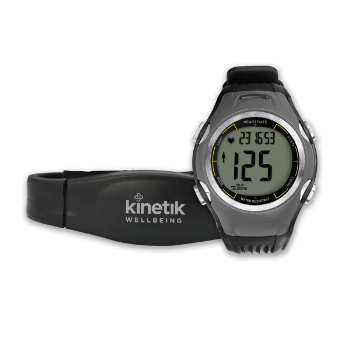 Kinetik Wellbeing’s Heart Rate Monitor can provide real-time, continuous and accurate heart rate data during many forms of exercise, from running to cycling to accompanying your gym workout. The Kinetik Heart Rate Monitor measures your current, maximum and average heart rate. Its functions include a basic watch format, built-in alarm, stopwatch, backlight and calorie counter. The heart rate data is transmitted from the chest strap which comes included.